Spring is almost here! 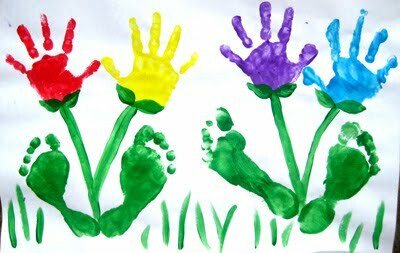 Looking for a great way to get your children engaged in crafts while also creating a great memento of their perfect little feet? Try this easy project on for size! 1. Choose your colors for the flowers. Place your hand and foot prints on the page as illustrated on the right. Carefully clean off (and dry, to avoid athlete’s foot!) your child’s foot, using regular baby wipes or a wash-rag. 2. Draw in your stems with a paint brush. 3. Paint on leaves and add the name and date to either a stem or on an empty part of the paper. 4. Frame if desired as a keepsake. This little project is a fairly simple one, but sometimes it can be tough to figure out why your child’s foot is hurting. If your little one is experiencing foot pain of any kind on a regular basis, schedule an appointment for a comprehensive evaluation with Dr. Andrew Schneider.